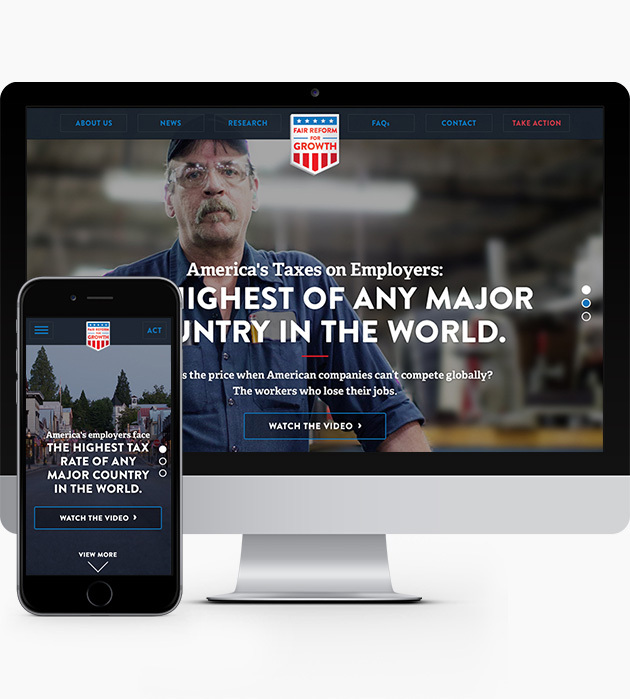 Working with the Digital and Design Team at Purple Strategies, I worked on a campaign website for a coalition aimed at reforming American corporate tax laws. We designed a news and information-driven website to educate users with little knowledge on the issues and to be a source for current supporters. After gaining new supporters or recruiting current ones, the actionable goal of the website was to get visitors to “Take Action” and show their support for the cause by contacting their state senators and representatives. 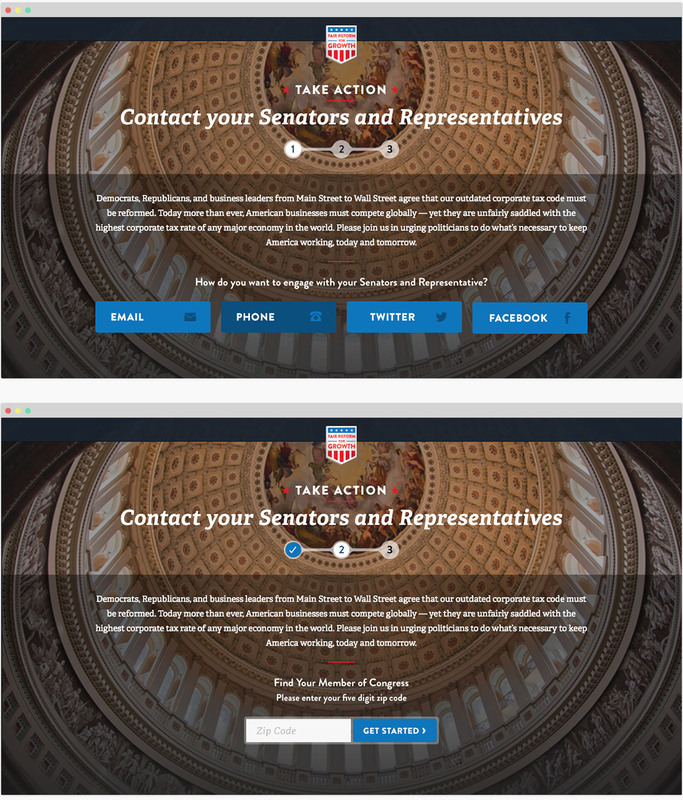 For this we created a “Take Action” hub where we took users through a step-by-step process to contact their lawmakers. By offering an array of contacting options, we were able to appeal to an older generation who may be more comfortable calling or writing a letter, as well as the younger Millennials who may prefer to contact via Facebook or Twitter. 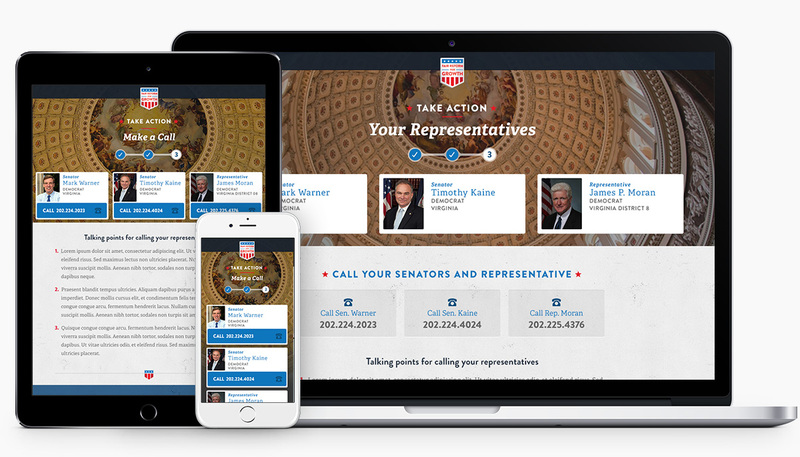 After selecting a form of communication, the user is prompted to enter their zip code, which allows us to pinpoint their senators and representatives for easy communication. Finally, to ensure the highest click-through rate and lower users’ desire to abandon the process, we made it completely responsive to work seamlessly on desktop, tablet, and mobile devices. Moreover, from a content perspective, the information changes based on any given device. On mobile the copy is short and succinct, providing clickable buttons to complete an action such as calling your representative. On desktop more information is provided such as suggested talking points once you are in contact.